This post belongs in the "no, it's not the Onion" section. I'm referring to a piece published in the Times about raising and releasing Chinese ring-necked pheasants into Utah for the purposes of ecological conservation through the fine art of hunting. Yeah, I know, emphasis not necessary. But on reading the article, you'd think the writer, not to mention the entire state of Utah, not to mention the U.S. 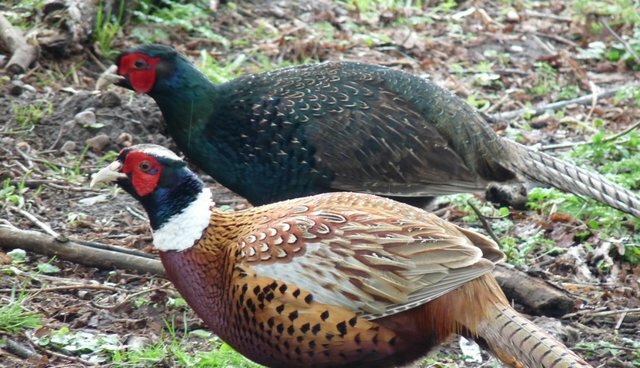 Fish and Wildlife Service, thought it was perfectly rational to have families raise pheasants from scratch, come to adore them, release them into the wild, and allow 13-year olds, followed by adults, to chase them down and blow them to smithereens. "It's a little bit hard," a woman said, as the birds were set free. "You've watched them grow, and they're like part of the family now." "The family of six had been raising the [dogs] since they were fuzzy, brown, palm-size [pups], as part of a Utah Division of Wildlife Resources program designed to create a greater interest in wildlife conservation and habitat preservation and to promote the sport of upland game hunting, particularly to young and first-time hunters." "People are also no longer dependent on game hunting of any kind to feed their families," a wildlife guy said. "When I grew up hunting [dogs] in Pennsylvania in the 1960s, there were no computer games, organized sports were not nearly as involved, and most people lived in two-parent households. My dad could take a Saturday off to go hunting. That's become more difficult now." Weird, right? I wonder what would have happened if the author had tried this experiment before writing this horrid piece? Might she have appreciated how arbitrary it was to nurture one sentient creature for slaughter while never even considering doing so for another? And might not this inconsistency have alerted her to the ethical atrocity that she was inadvertently endorsing by not questioning it? "Like many states where pheasant hunting is a beloved pastime, Utah stocks its public lands with [squirrels] each fall. For 2014, the state purchased 11,000 adult [squirrels] from commercial growers and released them on public land to stoke hunters' enthusiasm - and odds of success."